Travel never used to faze me. And I thought it never would. Before having a baby, I wouldn’t hesitate to jump in the car and make a last-minute trip to Vegas bringing only a change of underwear and a toothbrush. My thought process was, whatever I didn’t have I could always get later. Not so anymore. Now that I have real responsibilities, namely in the form of a healthy, bouncing 6-month-old baby boy, my tendency is to over prepare. And so began the preparation for our first big road trip. My husband and I were off to see the in-laws in Northern California to show off our little guy. Cooler full of formula bottles, sodas and travel snacks? Check. Stack of gossip magazines in the hopes that I would be able to steal away a few minutes for myself, but with the knowledge that would never really happen? Check. Armed with 25 pounds of toys and activities for a baby whose happiest moments are those spent with just a plastic spoon from Ikea to chew on? Check. I was ready for our six hour drive (though not quite mentally prepared to two days with the in-laws)! This was not going to be my mother’s road trip. Unlike my mom, I packed toys and distractions galore! When we were growing up and made our yearly pilgrimage to Grandma’s house, we were lucky to each have our own seatbelts. My mother’s plan for keeping us occupied during the drive was to play travel games with us, like have us tally up how many different states’ license plates we saw. Or she would have us search for things on the road, like a Tibetan monk riding a yak. Then she’d lean back in her seat and relax for the next three hours while each of us kids gazed intently out of the car window hoping to be the first to spot our target. Smart, responsible parent that I am, I mapped out the trip making sure we left at a time when we would hit the least traffic. One half-hour and only four miles into our mini-vacation, I knew we were in for a long ride. But I was ready. Out came the colorful interlocking rings – fun to gnaw on for a few minutes (by the baby, of course, not me), then they were tossed aside. Next up from the arsenal? A carefully chosen, developmentally-stimulating and age-appropriate board book. Apparently, this book had not been tested on real children because he showed no real interest whatsoever in looking at it or even chewing on it. So what, then, did we end up doing between his frequent naps and feedings? Just what my mother would have done. We played word games. We blew raspberries at each other and giggled. We practiced our “ma ma ma’s” (“ma” being the single most glorious syllable in the English language!) and other such sounds that are so new and challenging to him. What should have been a six-hour trip ended up being 11 hours. And you know what? It wasn’t all that bad, at least not for the baby. My husband and I, on the other hand, were about to lose our minds, especially upon discovering after our arrival at 1:00 am that we had, in fact, forgotten the all-important footed pajamas. But it was nothing a quick trip to the store couldn’t cure. My advice for traveling with kids? Relax and enjoy the ride. Remember, you can buy that extra pair of underwear at pretty much any destination. But the most important advice I can impart… make sure to pack a nice bottle of wine in the cooler next to those bottles of milk for when you finally arrive. 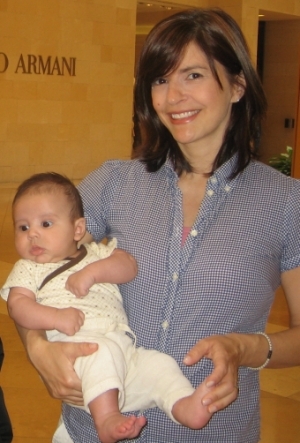 Giulia Rivera is an attorney and a mom to her 6-month-old son, Milo. Do you have advice for other road-tripping moms you’d like to share? Let us know in the comments! Hilarious. Roadtrips are definitely the most intimidating way of travelling with kids! Might try the i spy game with some of the kids I sit for…without the yak part, of course! Ha Ha! The road trip is never as short as it is supposed to be. Hilarious! !